World powers are stepping up efforts at the UN to reach agreement on a Security Council resolution aimed at ending violence in Lebanon and Israel. A meeting of key Security Council members ended without agreement late on Thursday. More talks are due on Friday. However Russia says a deal may be a long way off and it plans to table a separate draft calling for a three-day truce for humanitarian purposes. The UN moves came as Israel resumed its bombing raids over Lebanon. Eleven civilians were killed in a raid in Akkar province near the Syrian border, while an area of southern Beirut was bombed early on Friday. Fighting is also continuing between Israeli forces and Hezbollah guerrillas near the Israeli border in southern Lebanon. The Israeli army said a soldier was killed in fierce clashes in the western Lebanese village of Labuneh, and 19 soldiers were injured in fighting across southern Lebanon overnight. Earlier, the Israeli military confirmed the death of a soldier near the town of Marjayoun. Two armoured vehicles from the UN peacekeeping force, Unifil, have been sent to Marjayoun to evacuate some 350 Lebanese soldiers and police who are holed up barracks there, Lebanese security officials said. Israel says plans agreed on Wednesday for an extended ground assault in south Lebanon are on hold to give diplomacy a chance. There is still no agreement at the UN on a resolution calling for an end to the fighting. 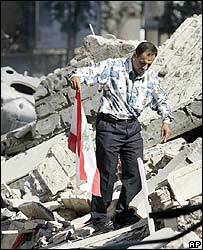 Lebanon demands an immediate ceasefire and a quick Israeli withdrawal. Israel says it will fight until new foreign troops and the Lebanese army move in - a position which Washington has supported. On Thursday officials expressed optimism that a deal on the wording of a resolution might be reached soon. The deal is understood to centre on introducing Lebanese troops into the border region, strengthening Unifil, and giving it a tougher mandate. At the same time, the text would call on Israel to begin a phased withdrawal. However the Lebanese government - which includes Hezbollah - appears to be objecting to a strengthened mandate allowing UN troops to use force. 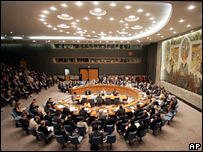 A meeting of the five permanent members of the Security Council late on Thursday failed to produce agreement. UK Foreign Secretary Margaret Beckett flew to New York, saying she would "reinforce Britain's efforts to reach agreement". US Secretary of State Condoleezza Rice and French Foreign Minister Philippe Douste-Blazy are also expected. Russia, meanwhile, said it was introducing its own draft resolution on a three-day humanitarian truce. Russian ambassador to the UN Vitaly Churkin said this was because there was no deal in sight. "War is raging in Lebanon and the humanitarian situation is getting catastrophic," he said. However the Russian idea was rejected by Israel and described by US ambassador to the UN John Bolton as "unhelpful". The new UN Human Rights Council is due to hold an emergency session on the conflict in Lebanon on Friday. It was requested mainly by Arab states, demanding action on what they describe as "gross human rights violations" by Israel. But Israel has criticised the request for a session, because it makes no mention of Hezbollah's attacks. As of Thursday evening, more than 1,000 Lebanese, most of them civilians, have now been killed in the month-long conflict, Lebanon says. Some 122 Israelis, most of them soldiers, have also been killed.